I made this dish especially for my son, Benny, on his birthday. This is a delicious recipe that I got from my dearest mother in-law. Thank you Cynthia! Combine salt and pepper in a small bowl. Put aside. Put a roasting pan next to the kitchen sink. Wash the chicken and take out the giblets. Pat the chicken with a paper towel. Put the chicken into the roasting pan and rub it with salt and pepper. Put the lemon wedges and the garlic inside the chicken. Tie the chicken legs with kitchen string. Roast the chicken until the timer pops, about 1 1/2 hours. 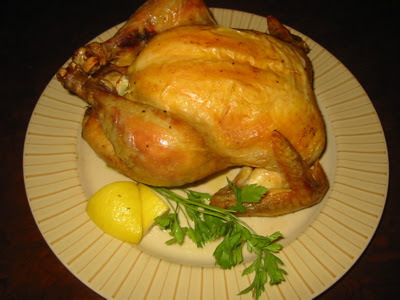 Check the chicken after 1 hour and brush it with the "chicken juice" (grease from the chicken) in the roasting pan. Continue to cook. When the timer has popped, the chicken is cooked. I like to let it cook 15 more minutes to get the skin nice and crispy. To make gravy, transfer the roast chicken to another plate and cover it with foil. Meanwhile, put the roasting pan on top of the stove over medium high heat. Add the flour into the chicken juice in the roasting pan and mix them with a whisker. Pour water into the roasting pan and increase the heat to high heat. Stir occasionally. Season with salt and pepper. Be careful not to make it too salty. Continue cooking until the gravy is thick. 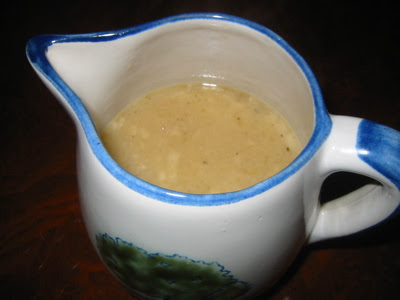 Pour it into a gravy bowl or any small bowl. Serve with warm rice.